*This is Part 1 of analysis of this film. Read Part 2 HERE. A motion picture is generally not studied in a literature class due to the nature of its type – devoid of any written words. However, it is my personal believe that a motion picture is a very good medium to study representation of images (not just for film schools). Because a film does not have the luxury of the written words, one of the elements which writers/screenwriters/directors manipulate and exploit is figurative representation to give auxiliary meaning, idea or feeling. This figurative representation has a collective effect when used properly, along with good acting, lighting, setting, and all that makes a motion picture. **Click on images to open. All images are copyright protected. 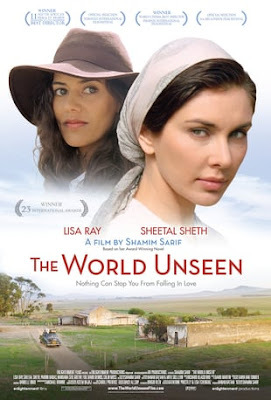 The World Unseen is a 2008 historical drama film written and directed by Shamim Sarif, adapted from her own novel of the same title. The film is set in 1950s Cape Town, South Africa during the beginning of apartheid. The World Unseen is critically acclaimed and has received warm reception, winning numerous awards in various film festivals around the globe. It was released in 2008/2009. The film The World Unseen is chosen for this study because of its richness in figurative representation. The study is removed from the novel, which the film is based on. At its core, one of the themes of the film is love. It makes a number of statements about love: love blossoming in very difficult circumstance, love transcending racial barrier, forbidden love, familial love, parental love and the struggles of love. Charactonym is when the name of the character has a symbolic meaning. In Arabic, the name means “trustworthy/trustful”, while in African, it means “peaceful, secure’. It is obvious in the film that Amina is trustworthy, when she hides Rehmat from the policemen, knowing very well the kind of trouble she could get herself into if she was discovered (and this is not the first time she gets into trouble, according to Farah). She is also at peace and is happy with who/what she is, as she dresses as she pleases, goes anywhere she wants, and does anything she likes. The name has several meanings based on several theories. In Egyptian, it means “beloved”, and we can see that Miriam is loved in the story; at least by her children and Amina. In Hebrew, it means “waters of strength” and “rebellious, disobedient”, which we can also see in the film. Though initially Miriam is portrayed as weak and docile, she evolves into a stronger woman as the story develops, who tries to challenge status quo, stands up to her husband, and pursues what she wants to do, which are learning how to drive and being a cook (by standing up to her husband, she is being disobedient). All these three characters are nameless (no first name, at least) in the film. While Grandmother is nameless perhaps to represent all typical Indian grandmothers, her parents’ namelessness is a bit interesting. Her father is not a typical Indian man – he doesn’t mix with anybody (but somehow is up-to-date with the current gossips), doesn’t pressure Amina into marriage, and doesn’t restrict her movement and freedom. Perhaps his namelessness is to illustrate his individualism, and how he is different from a typical Indian father. Amina’s mother on the other hand, is a rather typical Indian woman – listens to her husband, serves her mother in-law well, and takes care of the household – but is torn between a demanding mother in-law and a rebellious daughter. While the father’s namelessness is to show his individualism, his wife’s namelessness is perhaps to show the complete opposite. The Turkish name means “princess” or “a woman of rank”, which is ironic, considering how badly she is treated – how she is raped and gets pregnant, and how she is beaten for carrying this child (thus bringing great shame and dishonour to the family), is sent back to India with the child, and has her son taken away from her. Metonymy occurs when a related object, a part of a related object or an idea is used to represent the whole. Often, it used to represent the whole of an abstract idea. They represent a daily life is a housewife – chores which Miriam does on almost daily basis. They show that Miriam, as a devoted mother and with a strong maternal instinct, is always serving people around her. We don’t really see other people doing anything for her, except when she is in labour (Omar brings her bottled drink and Mrs. Benjamin brings her tea). It is a typical role expected of a traditional Indian woman, and she embodies that. As a whole, the poem refers to God’s love. It is a kindly love which is welcoming, encouraging, observant, hospitable and solicitous. It makes the persona feels accepted and worthy, that he is the “worthy guest”. In the film, we only hear the first eight lines of the poem, the part where Love is welcoming the persona as his guest. The persona feels that he is not worthy to be a guest because he is “guilty of dust and sin”. In the Bible, “dust” also refers to human or flesh. So we can interpret it as the persona saying that he is guilty of all the imperfections that come with being a human, such as desires and lust (and thus, he also sins). Miriam clearly feels stirrings in her for Amina at this point of the story (Love bade me welcome). But she has reservations about it because above all else (the cultural restrictions and the type of attraction), she feels she is not worthy enough to accept it (yet my soul drew back). However, Love is kind and accepting, and tells her that “yes, you are worthy” (You shall be he). Imagery is when the author invokes sensory details. In written works, it helps the reader to visualize what is being described. In a motion picture, I believe it is used to provide overall effect of a scene, usually through facial and bodily expressions, sound effects and background images. Visual imagery - to show how desolate and isolated the house/shop is. It could also represent how Miriam is feeling – removed from her husband, children and society. Auditory imagery – it amplifies how quiet it is in the morning in the household and in the countryside. Visual imagery to show her self-confidence and how comfortable she her with herself in bright and bold colours (orange, red), in contrast with Miriam, whose clothes are mostly lacklustre and of natural colours (white, blue, green). Auditory imagery – the sounds of the flapping of the clothes on the line, birds singing, and sounds of wind blowing show how quiet it is out there. Visual and auditory imagery to highlight how beautiful and quiet the countryside is, with the sunset in the background and crickets chirping. Auditory imagery – to show how loud and merry the ceremony is, where everyone is enjoying themselves, despite their obvious challenges living in South Africa at the time. Feasting and dancing is an important element in an Indian wedding because it signifies approval of family and friends of the marriage. 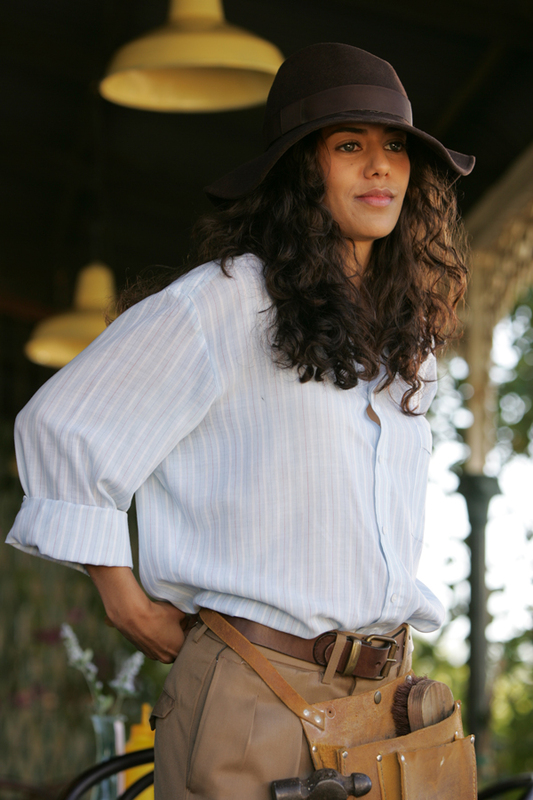 Kinesthetic imagery – the tension Amina brings with her into the shop, which Miriam picks up when she looks at her. The audience could also sense Amina’s anxiety, nervousness and angst when she walks into the shop to confront Miriam. Auditory imagery – the night was very quiet, not even the crickets were chirping. We could also get a sense that is ominous because of that. Kinesthetic imagery – the tension between Miriam and Omar when he is frustrated that his wife is not backing down from her stand for the first time (to learn how to drive in order to work at the café) and that he is losing control of his wife. He believes that his wife’s place is at home with him. Perhaps gossips about Miriam and Amina he has been hearing doesn’t help either (the same one Mr. Harjan knows about). It is amplified by his overturning the table and trying to hit Miriam. Shamim Sarif. (2008). Director’s commentary: The World Unseen DVD. Enlightenment Productions: London. Wikipedia. (2011). Stylistic Devices: Figurative Language. Retrieved from http://en.wikipedia.org/wiki/Stylistic_device in October 2011.